Teeth whitening is one of most common cosmetic dental procedures because it improves the appearance of your teeth. The procedure clears stains and discoloration off the teeth to give it a lighter look. If you have been scheduled for teeth whitening with the dentist, you need to know what it entails. The presence of other dental issues such a teeth cavities can affect the teeth whitening procedure. In some cases, the dentist may take photographs of your teeth or perform an x-ray. You will also answer some questions to determine the cause of the stain or discoloration. If you have veneers or porcelain crowns on your teeth, the procedure will not work for you. If the dentist detects signs of tooth decay or receding gums, he or she may not proceed with the process since it may cause teeth sensitivity. The dentist will proceed to clean your teeth to clear up food debris, bacteria film, or other substances that accumulate on your teeth to cause a stain. When teeth are thoroughly clean, then the whitening procedure can start. The whitening procedure has two main options: Non-vital whitening for teeth without live nerves, caused by previous root-canal treatment, and Vital whitening for teeth with live nerves. This option is the most common type of tooth whitening. The dentist first covers the gums around your teeth with a substance to shield them from the whitening process. They will then apply a powerful whitening gel containing a type of hydrogen peroxide on the teeth. Afterward, a special light or laser triggers the gel to hasten the bleaching process. The procedure typically takes between 30 to 90 minutes. Depending on the nature and severity of the stain, the method used and the level of whiteness you want, the number of appointments you would require varies from one to three. Different stains react differently to the treatment. 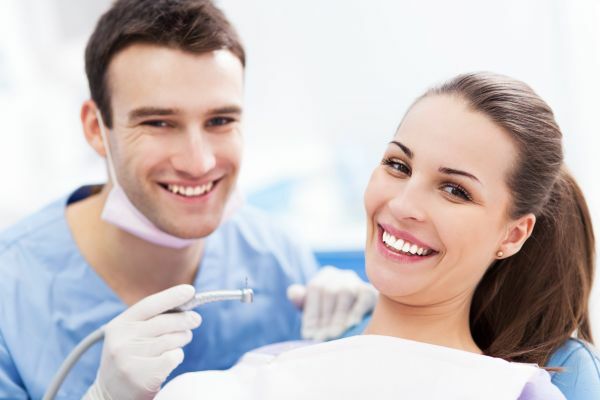 If you have had root canal treatment, then the dentist will use a procedure that whitens your teeth from the inside. They will apply the whitening agent inside the tooth and cover it with a temporary filling. The tooth will be in this state for some days. This is because the stains are produced from the inside. You can have this treatment done once or repeatedly, depending on the shade you want. Although the teeth whitening procedure poses no significant risk, it may cause teeth sensitivity for a while. You may also experience irritation on your gums. This should typically disappear after a few days. If the soreness continues, reach out to the dentist to ask questions. Understand that the procedure does not offer a permanent solution. If you smoke, drink coffee, or eat a lot of teeth-staining foods, the whiteness may start to fade after a month or two. Usually, if you follow your dentist’s recommendations, you should need another teeth whitening procedure for another 6 to 12 months. Request a dental appointment here: http://www.beverlyhillsfamilydentalgroup.com or call Beverly Hills Prestige Dental Group at (310) 286-9655 for an appointment in our Los Angeles dental office.